Some manufacturers of electronic nicotine delivery systems (ENDS) voluntarily carried health warnings in their advertisements. This study examined these voluntary warnings in magazine ads and plotted their trends between 2012 and early 2015. ENDS magazine ads were obtained through Kantar media and warnings were collected from the Chicago Public Library or the Trinkets and Trash surveillance system. The prevalence of voluntary warnings, warnings with the specific capitalized word “WARNING”, and MarkTen warnings were examined after being weighted using factors related to exposure between January 2012 and March 2015. Five brands (MarkTen, NJOY, MISTIC, and some Blu) carried warnings during the study period. The prevalence of warnings post 2012 that contained a description of nicotine did not significantly increase until the launch of MarkTen, which also happened several months before April 2014 when the U.S. food and drug administration (FDA) published its proposed deeming rule. In addition, none of these warnings met the criteria required by the FDA in the final rules. 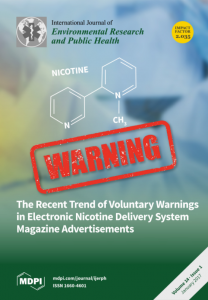 Voluntary warnings, particularly MarkTen warnings, significantly increased in ENDS magazine ads between 2014 and 2015. It is important to monitor how ENDS manufacturers will comply with the FDA regulation related to warnings and how this regulation will ultimately impact ENDS risk perceptions and use.